Customer Service was fantastic and the shipping was right on time. My sons are totally thrilled. I had bought my other kids Japanese branded quads before and paid a lot of money for them(i sold them long ago as those "kids" are now 21&16) and kids being kids they ended up destroying them!So for my youngest kid who is 8 i bought this and i have to say i was skeptical at first but can happily say that the manufacturing is pretty good.I opted to assemble myself and it took me about 3 hours. Service from the sales force was great as was communication and ease of purchase.It was delivered quicker than expected and originally indicated which was a bonus.Chinese manufacturing has come a long way much like the Japanese did in the 70's. I purchased 2 Coolster 125cc atv’s about 4 months ago. I received the atv’s in a timely manner and they were packaged securely in a metal crate on a pallet. Instructions on assembly could be a little better but were sufficient. I assembled the first one in about 40 minutes and then the second one in about 15. One arc was idled to high but was very easy to adjust with the side screw on the carburetor. Within a week my daughters surpassed the break in period with no issues. Oil changes were easy enough and they seem to be running strong. At 220 lbs it will carry me around 30 mph which faster than I care to go. I’m not a fan of maxing out a motor. I’ve had them for 4 or 5 months and no problems yet and my girls have been racking up the hrs on them. It’s good to see them enjoying the outdoors instead of staring at videos and social media all day. I am very happy with the product. Ok ATV. Engine runs good, just doesn't transfer full torque to the rear wheels through the clutch (like the clutch is slipping). Will get with PowersportsMax support on that. Bought for daughter's 9th birthday and she loves it. Recommend PowersportsMax. Good service and great prices. My kids absolutely love their ATV. We have had no issues with it at all!! Thank you providing quality products at an affordable price!!! Bought it for our grandsons, lets just say I am grandma of the year with them. My husband loves the way it is put together, very well engineered. I love the automatic for them & me too. The ATV's are really great and our grandsons love them! They were everything that was promised and the performance and handling are great. So glad we ordered from you. Excellent service, fast shipping and delivered what they promised. Would highly recommend PowersportsMax. Very pleased with the ATV's we purchased and they run great. The ATV is great and lots of fun! I got this for Grandson and he is very happy with it. The ATV arrived quickly and the service was excellent. It's a great value and highly recommend it. This is probably the best purchase we have made. We bought this bike for our 6 year boy and this ATV is well built. We are 100% satisfied with the investment, because I feel like this is something great for Luke for the next few years. I picked your site because I saw all replacement parts, technical support for the customer and the fact you guys have an actual address with a warehouse. I would highly recommend you guys. 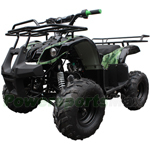 We are 100% satisfied with the purchase of our ATV 125cc. This ATV is well built and cranked on the first inital startup, that was impressive. The main reason we choose Powersportsmax was, they carry all replacement parts, technical support for the customer and the fact they have a warehouse with an actual address. I would highly recommend Powersportsmax.com to anyone buying an ATV. We received atleast 4 emails from Powersportsmax, from the time we ordered to the time it was received, Maybe 5 days - from California to Louisiana. The pricing on the unit was well worth with what we received. My nephew who works for a local Yamaha dealer in town could not believe the price and quality. He said this same unit was over $2000, and we paid a little more than a quarter of the price. Thanks again!